"Super quick and delicious egg rolls! Great as an appetizer, side dish, or after school snack. Be creative with the filling by adding other things such as crabmeat in place of the shrimp. 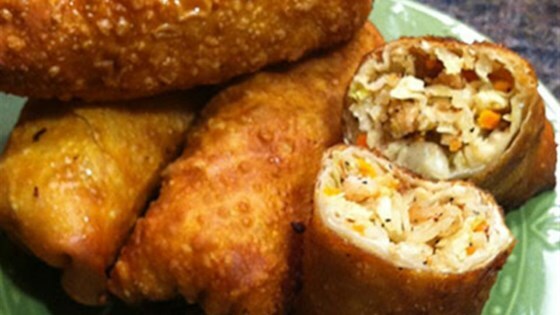 Who needs take out when you can make egg rolls yourself?" Place coleslaw mix in a large, microwave-safe bowl. Microwave on High until mix is wilted, 5 minutes. Let cool. Stir in the shrimp, garlic, pepper, Diamond Crystal(R) Fine Sea Salt, soy sauce, and onion powder into the coleslaw. Mix until well blended. Place one wrapper on a flat surface with a corner pointing toward you. Lightly brush the four corners with a little water. Place second wrapper, about one inch off center to the right, on top of the first wrapper. Place about 1/3 cup vegetable mixture in the center of the stacked wrappers. Bring up bottom corners to cover just over the mix but not all the way to the top corners. Dab wrapper with a little water. Pack filling inside well and fold in the 2 sides till just about touching. Wet the remaining top corners with a little water and roll the filled wrapper portion tightly toward it and press to seal. Heat oil in a large pot to about 375 degrees F (190 degrees C) or medium high heat. Fry egg rolls, turning occasionally, until golden brown 5 to 7 minutes. Drain on paper towels and cool slightly before eating. Serve with soy sauce and hot mustard for dipping, if desired. Entirely too much black pepper for this recipe. That’s all we could taste while eating it. I suggest reducing to 1/2 or 1 tsp, instead of two.